The LAS Kripton is an aggressively styled and light helmet with a couple of nice design touches. 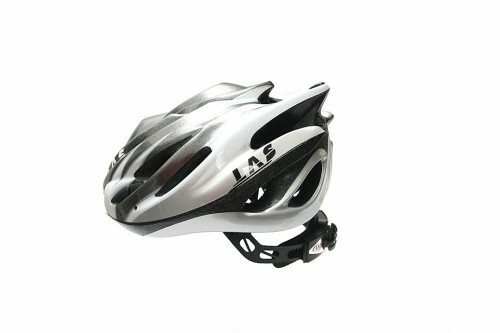 It's a very comfortable and secure lid, and offers performance to rival many helmets costing a lot more. There's only one size, which means that the retention system has to be adjustable for a wide range both in terms of circumference and height, and it copes admirably. The height adjustment band is a push fit into the lateral strap and it sometimes comes out when the helmet's off the head, but I've never had a problem with it while it's being worn. Inside there's a single-piece pad which also doubles as an insect net. This has bot good and bad points. On the plus side it's supremely comfortable and easy to remove and wash. However it does tend to flatten your hair, making the lid quite warm. There's a range of three liners available for all the seasons. The strap is the usual webbing affair with a generous chin pad and there's also pads on the retention system. On the bike it's probably the most comfortable and secure helmet I've tried. Helmets are a personal thing, so as usual the advice is to try before you buy, but I've nothing but praise for the fit and comfort. At 245g it's hardly a heavyweight either, and at £64.99 it's very good value. I haven't needed to rely on its bump-absorbing qualities but it passes the relevant tests, like all the rest. The Kripton is well designed, well constructed and very comfortable (for me). The single piece pad adds practicality and comfort, and the retention system is very secure. For the money, it's a great lid.